Under the absence of any synoptic weather systems, dry weather is set to continue over TN with bright sunshine and increasing day time temperatures. Coastal weather is expected to be pleasant whereas interior heating is expected to accelerate. No rainfall is forecasted over the state as the seasonally dominant high pressure area continues to prevail. 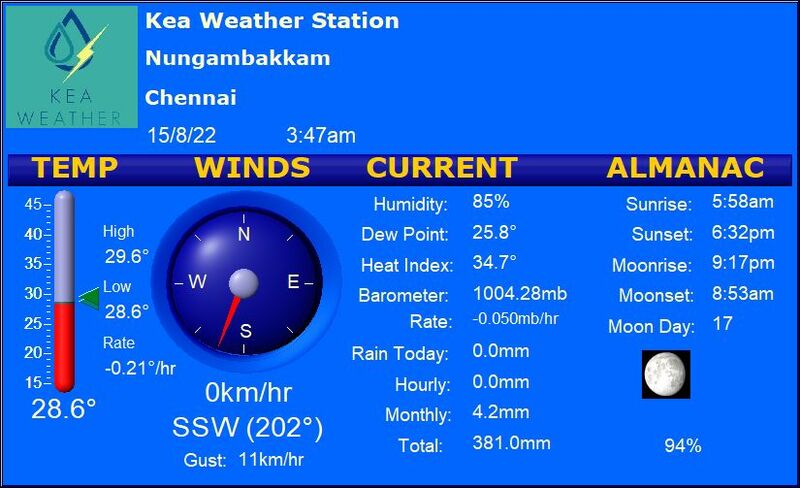 Chennai – Partly cloudy with a high of about 30 degrees and a low of about 24 degrees. Vellore – Sunny with a high of about 34 degrees and a low of about 21 degrees. Madurai – Warm and sunny with a high of about 35 degrees and a low of about 24 degrees. Trichy – Lots of sunshine and very warm with a high of about 36 degrees. Coimbatore – Mostly sunny with a high of about 33 degrees and a low of about 20 degrees.